I have just jailbroken my iPad on iOS 4.2.1 using PwnageTool bundles released by Johnny Franks. These bundles can be used to jailbreak the newly released iOS 4.2.1 GM on both iPad and iPod touch 4 with working Cydia ! The process involves patching of the existing version of PwnageTool with these new bundles, and then using it to build a custom firmware file for the mentioned iOS devices. To make Cydia working, you will have to use the included patched Cydia binary and use bspatch command to apply this patch, more on this in the detailed step by step guide posted below. i) First you need to download PwnageTool 4.1.2. The download link of PwnageTool 4.1.2 is given at the end of this post. 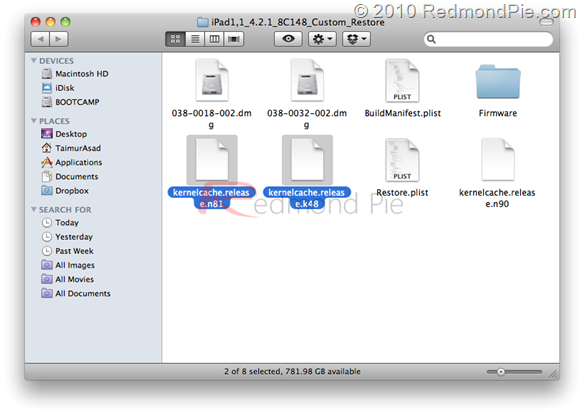 ii) Now you need to download the most recent release of PwnageTool Bundle for iPad and iPod Touch 4 running iOS 4.2.1. The latest version of PwnageTool bundles can be downloaded from here. 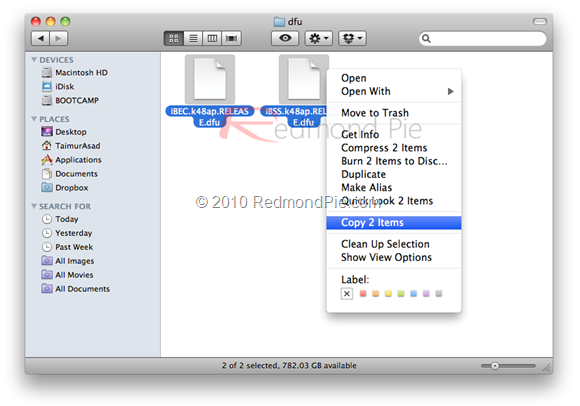 iii) Copy the downloaded files to your desktop. 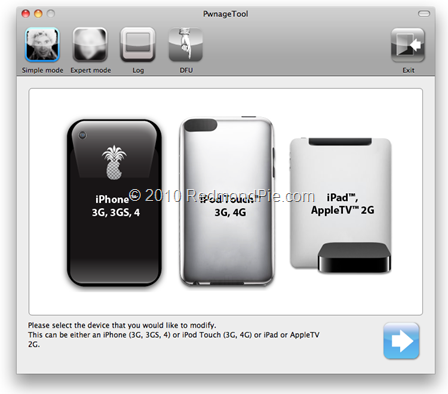 iv) Download iOS 4.2.1 GM .ipsw file suitable for your iOS device. The official way to get the GM releases is to be a registered Apple developer. Otherwise you can search it on internet. We can’t provide the download links as it is illegal to share so please don’t ask us. v) Place the downloaded PwnageTool in a folder on your desktop for quick access. Right click on the PwnageTool package icon and click “Show Package Contents” demoed in the following screenshot. vi) Go to Contents/Resources/FirmwareBundles/ and copy/paste iPad1,1_4.2.1_8C148.bundle file here. Close all the windows when you are done. vii) Run this version of PwnageTool and select “iPad, Apple TV 2G” option (as we are jailbreaking iPad) and click next to proceed. viii) PwnageTool will take few moments to identify the iOS 4.2.1 GM .ipsw file. See the screenshot below for reference. ix) When the firmware is identified, click next and the process of building the custom jailbroken IPSW will begin. Hold Power and Home buttons for approximately 10 Seconds. Now release the Power button but don’t release the Home button for at least 10 seconds. You device will enter DFU mode if you see the message in the screenshot below. xi) Run iTunes and restore your iOS device to the custom firmware created in previous steps. To do this run iTunes and select the iOS device in the sidebar. Press and hold the left “alt/option” key on Mac or “Shift” key if you are using Windows and click “Restore” button (Remember! Do not click “Check for Update” or “Update” button). The file browser will open asking you for the .ipsw file. Select the recently created firmware 4.2.1 file and click “Open”. xii) iTunes will restore your iOS device with the firmware file you selected. Be patient and let iTunes finish the task. You can see the progress bar on your iOS device that will show how much work is done. When it’s done, your iOS device will restart automatically in jailbroken state running iOS 4.2.1.
xiii) Create a copy of recently created custom .ipsw file by using PwnageTool. Rename the file to change the file extension from .ipsw to .zip. Extract/Unzip this .zip file and you will see the kernel files inside it. If your iOS device is an iPad then grab k48 and if you have iPod Touch then get n81. Also copy such iBSS files located in /Firmware/dfu/ directory. See the screenshots below. xiv) Download tetheredboot file from here and place it in a folder at desktop named “tetheredboot”. Copy the iBSS and tetheredboot files in this folder that you copied in the previous step. Terminal window some code and when it’s done, you will need to restart your iOS device in DFU mode. Go to step x for the instructions to enter your device in DFU mode. When your device enteres DFU mode, tetheredboot will upload the kernel and iBSS files to your iOS device and will also patch the kernel. At this point, your device will show a white screen and after a while it will show slide-to-unlock screen that means you have followed the instructions properly. As the newer version of Cydia is not out yet that works on iOS 4.2.1, you will have to to patch the existing version of Cydia using MSFT_Guy’s method. This can be done by using bspatch command in Terminal. xvi) Get the Cydia.patch file for iOS 4.2.1 from here. SSH to your iOS device and copy this file to /Applications/Cydia.app/Cydia_ . Make sure SSH enabled on your device. You are done now, enjoy your iOS 4.2.1 device ! UPDATE 1: PwnageTool Bundle for iPod touch 4G on iOS 4.2.1 GM can be downloaded from here.